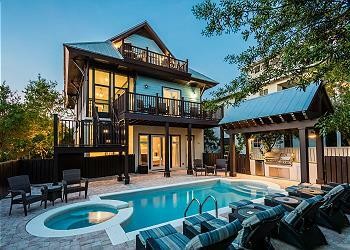 DETAILS: Look no further than this exquisite 5-bedroom, 5.5-bath for the perfect 30A getaway! With Gulf views, a gorgeous private pool, multiple decks, a chef’s kitchen and a short walk to the beach, this professionally decorated Seagrove Beach retreat near Eastern Lake is it. The kitchen features designer cabinets, a gas range and select stainless appliances. Magnificent hardwood floors open onto the dining area with table seating for 8 and island counter seating for 5. Relax in the living room before a stunning fireplace and a vast flat-screen television, and take your morning coffee out to the deck for a birds-eye view of the Emerald Coast. Aquamarine waters and white quartz sand beaches are just a short walk away. The first floor features a guest bedroom with a flat-screen television and a private bath with an amazing shower. Ascending the staircase to the second floor you’ll find the gorgeous master bedroom which offers a king bed and private bathroom with a shower and tub. Just down the hall is another guest bedroom with a king bed, private bath with a shower only. Also on the second floor is another guest bedroom with two twin-over-twin bunk beds and a private bathroom with a shower/tub combo – the perfect place for the young and the young-at-heart alike. Ascending up the staircase to the third floor you’ll find the second master bedroom, offering a king bed and private bathroom with a shower and a tub. Two full sleeper sofas provide additional bed space. In all, this 3-story retreat sleeps 16. It’s the outdoor living spaces and the stunning locale that truly set this gem apart. Decks can be accessed on all three floors, while the pool area serves as a focal point for the entire home. All of the fun and excitement of Seaside is just a few miles to the west. Meanwhile, Rosemary Beach and Alys Beach are a short distance to the east. “Beach Please” offers an exquisite example of 30A living for up to 16 guests, making it the perfect retreat for a gathering of friends and family. 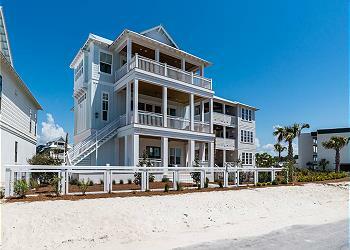 Contact 360 Blue to reserve this Seagrove Beach gem today! I can’t say enough about this home. It was perfect for our families staying there. It was a brand new home and has absolutely everything you need to enjoy your vacation. It is a huge home for multiple families but you still feel like you have your privacy in one of the large bedrooms and one of the living rooms. Perfectly clean and everything worked perfect. It was about a 1min walk to the beach which was great. The heated pool was perfect for the kids. One of the best parts is you are a 2 min walk to 30a but feel like you have a lot of privacy and no traffic. I would highly recommend this home and we plan on using it for all our vacations in the future. We are so glad that you enjoyed your time with us at this spectacular home in Seagrove Beach! We agree that this home is in a perfect location to get to and from the beach with ease and gives you privacy without isolating you from the surrounding communities! Thank you so much for staying with 360 Blue, we hope to see you again very soon! While the house is beautiful and in a great location there are a few things to consider if you are going to rent this place with a large group. There is no mudroom Or pantry and the second floor laundry is not practical for a beach house. The house is brand new which is a plus however, they are still working out some major kinks ie: issues with the dishwasher, ice maker and the hot water heater that has been out for hours! Daily for our entire stay - to name a few. 360 Blue has been good with communication and trying to fix the problems but recommend reconsidering this property until the kinks are worked out. Thank you so much for your valuable feedback! We are happy to share that the owners of this home have changed a few things since your stay and have now made space for a pantry in the home. We also checked the dishwasher and assessed that everything is in working order there. In regards to the hot water, we have repaired a faulty regulator in the system and everything is working normally now. We plan to check that daily for the first few days to ensure it remains that way. As for the ice maker, we do show it working properly and would like to point out there is also a stand-alone maker in the 3rd floor wet bar. We apologize if that was still not enough ice for your stay and we will continue to check the functionality of the ice makers for future guests. We appreciate your feedback and are so sorry you had these issues during your stay but hope you will give it a second chance now that these things have been resolved! Thank you for staying with 360 Blue! We are so excited that you all enjoyed your stay at this amazing home! We could not agree more that this home has something for everyone and with that spectacular outdoor space, whats not to love? Thank you for staying with 360 Blue, we hope to see you again soon! Great location, exceptional house - Highly recommend it!